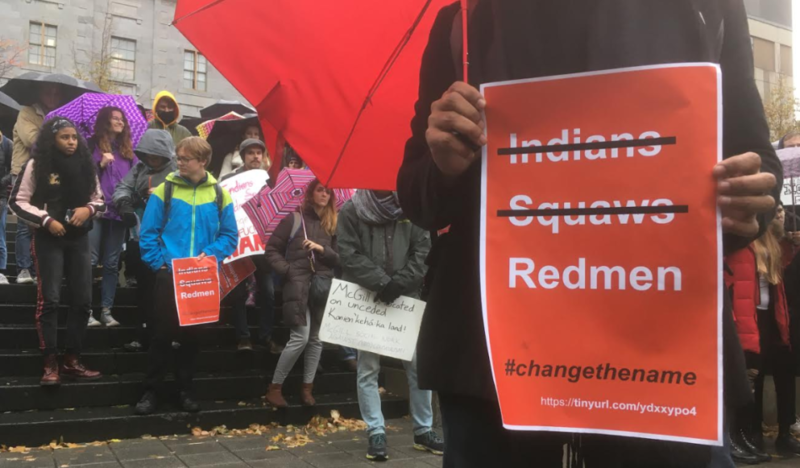 Following months of protests, petitions, and grassroots action from students and supporters, McGill University announced Friday it will be removing the Redmen name from its varsity teams. Principal Suzanne Fortier says the Redmen name is not one the university would choose today, and it is not one that McGill should carry forward. "Over the recent months, I have learned about the true depths of the pride that our student-athletes and alumni feel for the rich tradition and history of varsity sports at McGill. They feel a rightful sense of achievement. They are proud, too, of the loyalty, resilience, leadership, teamwork and friendships that mark their time in varsity sports. Many of them feel a strong attachment to their team name," Fortier said in a statement, released Friday. Effective immediately, the McGill men's varsity teams will no longer be called the Redmen. For the 2019-2020 athletic season, they will instead be referred as the McGill teams. The university says it will appoint a steering committee to lead a "consultative process for choosing a new name that everyone can wear, and cheer for, with pride," according to the statement. A new name is expected to be announced in time for the 2020 season. The Redmen name has long been criticized as pejorative, and for many students and staff members, conjures up anti-Indigenous sentiment. "I have learned about the true depths of the pain caused by the Redmen name. I have heard from Indigenous students at McGill who feel alienated by the name. They feel disrespected and unconsidered. They feel conflicted over their rightful pride in being Indigenous people, and their pride in being McGill students. This tension is even stronger for Indigenous student-athletes," Fortier added. She goes on to say the feelings about the team name "come from lived experiences" and are "strong, valid, and real." Last fall, Tomas Jirousek - a member of the varsity rowing team - began a very public campaign, #ChangeTheName, to convince the university to make concrete change. Women's teams, Jirousek highlighted at the time, are called the Martlets. In her letter, Fortier says the name Redmen was not adopted by the university as a reference to Indigenous peoples. Instead, she concedes that the name has taken on a negative connotation - "as evidenced by major English dictionaries," she writes. "Intention, however benign, does not negate prejudicial effect. Inclusion and respect are at the core of our University’s principles and values; pejoratives run contrary to who we are as a community," Fortier said. For this reason, the University says the name will not be carried into a "third century." The name dates back to the 1920s and has been described by some as a tribute to the teams' red uniforms. But in the 1950s, men's and women's teams came to be nicknamed the "Indians" and "Squaws," and some teams later adopted a logo with an Indigenous man wearing a headdress. "Evolution does not mean erasing history. McGill is, and will continue to be, proud of its history and tradition of athletic achievements and excellence," Fortier added. "Together, guided by our shared commitment to equity, inclusiveness and respect, we will determine our way forward."